Shunbo Zenkei Blanche Hartman, Roshi, a widely respected Zen teacher, former Abbess, and Senior Dharma Teacher of San Francisco Zen Center, died on Friday, May 13, in San Francisco. She was one of the first women to lead a Zen training temple outside of Asia. Her Zen teaching focused on simplicity, curiosity, patience, love, and compassion, and she sought to make the Zen community open and accessible to everyone. She was born Blanche Loeb Gelders in Birmingham, Alabama, in 1926, the daughter of Joseph and Esther Frank Gelders. Blanche spent her young childhood in Tuscaloosa, where her parents taught Physics and English at the University of Alabama. The Gelders family hosted a steady stream of students and professors who filled the household with vibrant conversation, much of which focused on the injustice and inequality displayed in Depression-era Alabama. When Blanche was in elementary school, her parents’ increasingly vocal stances on political issues cost them their jobs at the university. For the remainder of her childhood, Blanche’s family lived primarily in the Birmingham area, where Joe Gelders became a full-time labor organizer and civil rights activist. These were lonely years for Blanche, who experienced exclusion and harassment from her peers because of her parents’ work. Her family was threatened many times, and, when Blanche was ten years old, her father was severely beaten and nearly died. Though the Gelders family was Jewish, Blanche attended Catholic schools during the Depression, while the public schools were closed for lack of funds. She often spoke of one teacher, a nun, who provided a special comfort and inspiration to her at that time. When Blanche was seventeen, her family moved to Davis, California, where her father was stationed during World War II. Blanche, who had been fascinated by mechanics since she was a small child, was delighted to work as an airplane mechanic for the Army. She continued to work on and appreciate vehicles for the rest of her life. After the war, Blanche married Louis Hartman, with whom she had four children. The Hartmans lived in Berkeley, and continued to be involved with social justice and political organizing throughout the 1950s and 1960s. When Lou, a San Francisco radio personality, was blacklisted after refusing to cooperate with the House Unamerican Activities Committee, Blanche completed her chemistry degree at the University of California at Berkeley and supported the family as a chemist for the State of California. In the late 1960s, Blanche was part of a group of mothers supporting student protests at San Francisco State University. As a chain of mothers locked arms at a demonstration, to shield the students from a force of riot police, Blanche met the eyes of one young police officer. She felt his fear, and all at once she experienced a strong feeling of identity with this young man on “the other side.” Soon after, she discovered Zen practice. 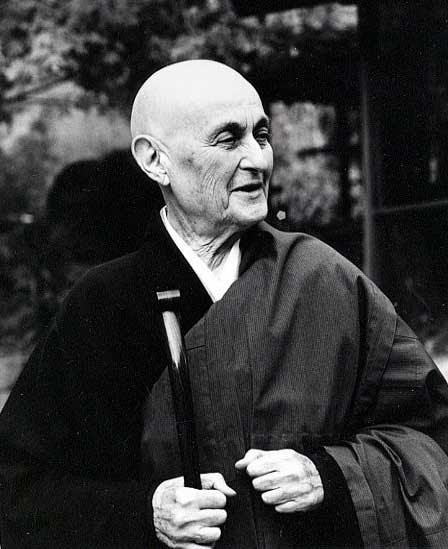 Blanche and Lou practiced Zen first at Berkeley Zendo with Sojun Mel Weitsman Roshi, then at San Francisco Zen Center with Shunryu Suzuki Roshi, Dainin Katagiri Roshi, and Zentatsu Richard Baker Roshi. In 1972, they moved from Berkeley to Tassajara Zen Mountain Center, beginning a lifelong commitment to Zen practice, which led them to Green Gulch Farm and San Francisco Zen Center’s City Center. Blanche was ordained by Zentatsu Roshi in 1977, receiving the name Shunbo Zenkei, “Spring Full Moon, Inconceivable Joy.” She received dharma transmission from Sojun Roshi in 1988, and in 1996, she became the first woman to serve as Abbess of San Francisco Zen Center. Blanche studied Nyoho-e, the practice of sewing Zen ceremonial robes, with Kasai Joshin Sensei, in the lineage of Sawaki Kodo Roshi. She taught this unique form of Zen practice to hundreds of students at Zen Center, and played an important role in establishing the practice in North America. Blanche was a central and stabilizing figure at Zen Center for more than 40 years. She helped guide the organization through turbulent times, and her patient dedication to Zen practice inspired generations of students to persevere. Her teaching will continue through her many dharma heirs and students, who transmit her love and compassion every day at practice centers around the world, and through her recently published book, Seeds for a Boundless Life, edited by her student Zenju Earthlyn Manuel. Blanche was preceded in death by her husband of 63 years, Lou Hartman, and her sister, Marge Frantz. She is survived by a large and loving extended family, including her four children, Joe Hartman, Earl Hartman, Trudy Briskin, and Mitzi Levine, and their spouses, as well as eight grandchildren, eight great-grandchildren, and her Zen students and sangha. I met Blanche at Daigan’s ordination. I was immediately aware of how extraordinary she was. I feel I was blessed to have met her. Please accept my condolences. May her light shine upon her family and extended family of all who knew and loved her. Aiyyee! Blanche Hartman, with deep affection, thank you! Thank you for this beautiful story. I am inspired. Thank you for telling me more of the range and depth of this remarkable woman’s path through the world. I met her at one of the lowest points of my life, when I was sunk in despair. She offered both unambiguous advice and a sterling example. Thank you for this beautiful tribute. Zenkei was formally my teacher for just two years, but she played a crucial role in my practice at many pivotal moments over more than three decades. I vividly remember our first encounter in 1984 — just as I remember my first encounter with Lou several months earlier. As a junior in college, I took a semester off to live at Green Gulch. During zazen on my first morning there, Blanche came behind me and adjusted my posture. When she touched me, very gently, something like an electric shock reverberated through my whole body, wonderfully: I felt bathed in kindness. “Who was THAT? !” I wondered, as she moved on. Every time I travel, I carry a small Jizo figure she gave me in 1987 at my Jukai, which I would never have had the courage to complete without her support. I remember her Mountain Seat Ceremony clearly, as well; it was a joy to see her installed as the first woman abbess of SFZC. (She was not the first woman to lead a Zen training temple outside Asia, however: Jiyu Kennett Roshi and Maurine Stewart Roshi both preceded her in that role.) I probably would not have become a scholar or priest if not for an opportunity she gave me in 1996 at Tassajara, during another crossroads in my life, to discern and begin those paths. I remember going to her after Tangaryo, all blissed-out, waxing poetic about how beautiful and perfect everything was, and she replied, “That’s nice. Pretty soon something else will happen.” A perfect teaching for that moment. She led both of the ango I completed at the beginning and end of my seminary education, taught me to sew my robes, and was the guest of honor at my Tokudo in 2003. Our relationship was not always easy, yet my gratitude to her is immeasurable. I’m glad I got to tell her so. Long may her Dharma ring! In 2007, arriving at San Francisco Zen Centre from India in the middle of an afternoon, I encountered an old woman with a face full of practice. I’d never seen a face like that in a religious institution, though I’d seen plenty in the old Aboriginal women I’d had contact with while working on a wages project in Queensland, Australia. Something turned in me, and I realised that I, too, would end my life with a face marked by the traces of steady attention and commitment to something no-one can put a name to. The woman, of course, was Blanche. She chose the colour of the thread for my okesa. She feels available to me now in a way I don’t really merit, which is kind of the point. I bow. My deepest condolences to Blanche’s family. She was a close friend and support of my mother, Lucille Harris. And a beloved holder of the Sangha for Lulu for many years….. In 1996, when Blanche was leading a practice period at Tassajara, a student who had been lying down in the zendo due to back pain let out a piercing shriek. She had fallen asleep and was having a nightmare. We were all startled–what was the zendo “form” for such a situation? But Blanche knew what to do–she rose from her abbess’s seat, went to the student and cradled her head in her lap, and told her, “It’s all right. It was just a dream. You’re going to be OK.” No thought about whether it was right to speak in the zendo, just direct loving action, nothing in the way. I guess that in one way or another, that is what Blanche has been teaching every one of us: It was just a dream. You are going to be OK. I think her method was so humble and so simple that I often couldn’t see it. I regret that, and I vow to do better. Thanks, Blanche. A few years ago I took advantage of the City Center’s generous, open-ended offer for anyone to do dokusan with a teacher there. Since Blanche was the only one older than myself, and I’d never actually met her face to face, I signed up for an interview with her. I had to get up before the first morning light to cross the Bay Bridge from Berkeley where I was staying. When I sat down with her in a small upstairs room, I was impressed with her exemplary zazen posture. The first thing she said was, “This time is for you.” But as we launched into an animated discussion, she more than held up her end of it, with stories of friends and Zen Center episodes from the past. I nodded in earnest agreement when she said that what made Suzuki Roshi so special was his ability to see the Buddha Mind in everyone he met. Since we were both quite old, we also talked of death at length. When two people are one in their innermost heart, even though they meet for the first time, it is like two old friends getting together after a long separation. We must have rambled on for an hour before she suddenly remembered there were others waiting to see her. When I got back to Berkeley, as I lay down for a brief nap, the soft light streaming in through a lace curtain on a tall window triggered a deep experience in me — one of those sublime “moments” that I think anyone who loves zazen occasionally experiences. I felt like it was an continuation of my meeting with Blanche. Blanche and Lou, reunited. Gassho. I live in México City, DF. I am sorry about your Master’s death. Reading the comments, I feel Zenkei Blanche Hartman was a great Master in your country, her life was dedicated to dharma. Buddha said that disciples are like a mirror of the Master; I’m sure her disciples will continue this legacy, young and old ones, in your country and other places too. So all of you are a mirror of your Master. I’m sure Buddha is happy with Zenkei Blanche Hartman and also with you. Your daughter Mitzi has been a blessing to this world! Zenkei’s book “Seeds for a Boundless Life” has truly been inspirational for me to come across in a local library in Victoria Point, QLD, Australia. Thank you most humbly.